Takes a leaf out of Slaven Bilić's book. 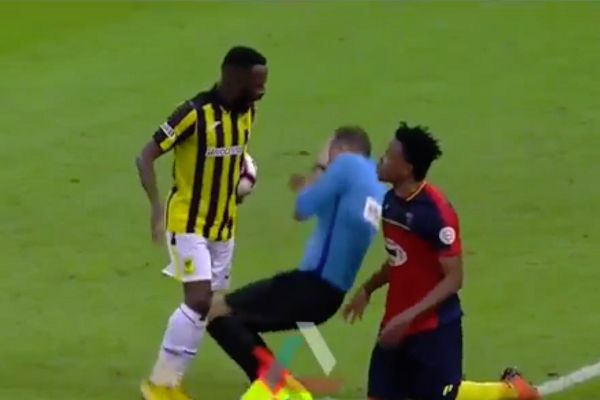 An assistant referee went down holding his face after a player made contact with him during Sunday’s Al-Ittihad v Al-Hazem match in the Saudi Professional League. The 2-2 draw at the King Abdullah Sports City stadium (nicknamed ‘The Shining Jewel’) descended into farce when a player from each side squared up to each other by the touchline. One of the linesmen attempted to intervene, only to be swatted away with a petulant swing of the arm from one of the feuding players. Although the contact is quite clearly not with his face, that’s what the official clutches as he hits the turf in what seems to be a peculiarly pointless dive. Al-Ittihad, who equalised in the 90th minute, are managed by former Croatia and West Ham United boss Slaven Bilić, who once pulled a similar stunt in a World Cup semi-final. On that occasion he made a meal of an altercation with France defender Laurent Blanc, who was sent off and missed the 1998 final against Brazil.